With the legislation passed in California (AB1953) and Vermont S152) serving as a catalyst for a national interest in the lead free regulations for potable water, a National Lead Free Bill was signed by President Obama in January 2011. This Senate Bill S.3874 (aka: Reduction in Lead in Drinking Water Act) that was signed will reduce the lead content in faucets, fittings and valves from 8% to no more than a weighted average of 0.25% maximum lead when used with respect to the wetted surface of pipes, plumbing fittings and fixtures or other potable water applications. This law will go into effect nationally January 1, 2014. EcoStream™ is a family of lead free and low lead brass alloys and products specifically developed to aid companies and manufacturers with their lead free compliance strategies for their products and components. Whether the need be for components machined from Mueller Brass Company’s GreenDrop™ C27450 Lead Free Brass alloy or forged parts from C37000 Low Lead Forging Brass, the EcoStream™ family of alloys and products provides further benefits by offering additional benefits for the manufacturer in areas of raw material costs and manufacturing productivity when compared to other lead free or low lead alternatives. With the customer in mind, Mueller Brass Company has developed Green Drop™ C27450 Lead Free Brass Alloy a practical solution for manufacturers seeking compliance to lead free regulations and legislation for their products. Unlike other lead free and low lead alternative alloys, GreenDrop™ C27450 was carefully developed with an industry-centric approach to address the specific needs of the manufacturers themselves. Instead of just purchasing the rights to an alloy originally developed for other purposes, Mueller Brass Company developed GreenDrop™ C27450 alloy specifically for those manufacturers needing an alloy to produce products and/or components requiring compliance to lead free regulations. In addition to being COMPLIANT, Mueller Brass Company also recognized the necessity for the alloy to be COMPETITIVE to help minimize the incurred costs associated with transitioning of existing products and the development new products to comply with these new standards. By carefully controlling the percentage of constituent elements required, and not introducing costly and potentially detrimental additives like silicon or bismuth, GreenDrop™ C27450 provides a competitive advantage over other lead free brass alloys. In addition to advantages in raw material costs, manufacturers also realize further cost savings in manufacturing productivity and efficiency. Because scrap generated from GreenDrop™ C27450 Lead Free Brass is completely COMPATIBLE with scrap from standard, commonly used alloys, the need to clean out machines and segregate scrap is virtually eliminated. Combined with superior performance in thread rolling, plating and brazing, GreenDrop™ C27450 Lead Free Brass Alloy is the perfect solution for machined parts and forged parts applications. As a committed supporter, and representative for the copper and copper alloy industry, The Copper Development Association (CDA) has worked closely with Mueller Brass Company and other members to provide guidance and information to ensure the magnitude and effects of the lead free legislation are addressed and identified. Provided for your reference are three pieces prepared by CDA that not only outlines the guidelines and requirements of the Lead Free Legislation, but also the impact and increased significance placed on recyclability and maintaining the integrity of the scrap stream. To further aid customers and manufacturers in their transition and adoption of Lead Brass Alloys, Mueller Brass Company has developed a “Machining Reference Guide” and a “Troubleshooting Guide”. These two pieces were designed as supplements to help minimize the learning curve associated with machining lead free and low lead brass alloys. Please contact Mueller Brass Company’s Customer Service for copies. The Restriction of Hazardous Substances Directive (RoHS) was updated on June 8, 2011. Although a number of substantial changes were made to the original version (Directive 2002/95/EC of the European Parliament and Of the Council); brass and brass rod products manufactured by Mueller Brass Company continue to remain exempt from RoHS Directive. This exemption is outlined in Exemption 6(CC) in Annes (III) of Directive 2011/65/EU. The brass rod products manufactured by Mueller Brass Company are not subject to the WEEE Directive per Article 3a. The REACH Registration (EC 1907/2006) is a new European Community Regulation on chemicals and their safe use. It deals with the (R)egistration, (E)valuation, (A)uthorization and Restriction of (CH)emical substances. The new law entered into force on 1 June 2007. Under the REACH Directive, an article is an object with a specially produced shape, surface or design, which is more important to the object's normal function than the chemical it contains (Article 3(3)). The REACH Implementation Project 3.8 (RIP 3.8) exempts substances in articles. Under the EU REACH guidance on articles, such products as coils, extrusions, rod and bar are considered articles. Therefore, the substances in these semi-fabricated products and the products produced from them are articles and the manufactuer or importer need not register them. (WEEE), and 200/53/EC (ELV). Note that brass rod is also exempt from the 2002/95/EC (RoHS), 202/96/EC (WEEE) Directives. On July 21, 2010, President Obama signed into law, “Dodd-Frank Wall Street Report and Consumer Protection Act”. Under this Act, the “Conflict Minerals Rule” (Section 1502) states that all issuers (any company that files reports to the Securities and Exchange Commission under Sections 13(a) or 15(d) of the Exchange Act – usually publically traded companies) are required to report to the Securities and Exchange Commission on the origin of conflict minerals in their products. This rule was proposed in December of 2010 and was finalized on August 22, 2012. Conflict Minerals are defined as tin, tantalum, tungsten and gold, which have been mined in the Democratic Republic of the Congo and nine(9) surrounding countries. Of the four metals, we only use tin as an alloying element in some of our alloys that we produce. The tin in our alloys is sourced from post industrial and/or post consumer scrap that we melt as part of our casting operation to produce new material. For your convenience, we have made available a downloadable version of our compliance to Conflict Minerals. Please feel free to contact Mueller Brass Company directly with questions, or should you require additional information regarding the topic. Proposition 65 (Prop 65) is a California Law initially proposed as the “Safe Water and Toxic Enforcement Act”. The original intent of this piece of legislation was to address public concerns regarding chemicals and compounds in the environment during the 1980’s. 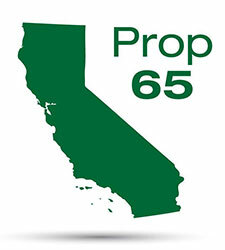 Prop 65 now dictates that California businesses with more than 10 employees that sell products into or within the state of California be required to provide “clear and reasonable warnings” about a chemical’s potential for causing cancer, reproductive harm, and/or birth defects on packaging or labels. The list of chemicals and substances specifically addressed in Prop 65 consist of a wide range of naturally occurring and synthetic materials known to cause cancer, reproductive harm and/or birth defects. 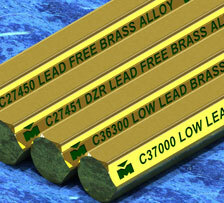 On the list is lead, which is found and used in certain brass alloys produced and shipped by Mueller Brass Company. For a more details list, please visit the Office of Environmental Health Hazard Assessment (OEHHA) for a downloadable list of the prohibited items. Certain brass alloys manufactured by Mueller Brass Company contains lead; a compound known to the state of California to cause cancer, birth defects and/or other reproductive harm. Parts made from these leaded alloys all contain lead in levels that may exceed the ‘No Significant Risk’ (NSR) and/or the “Maximum Allowable Dose Levels (MADL’s). In accordance with Proposition 65, finished products from these alloys and introduced into the stream of commerce in the state of California, must contain a warning label.